Smuggling is not a new phenomenon in this country, or for that matter, in this world. It’s an activity that is illegal, yet carried out worldwide. From drugs to people, smuggling is carried out due to various reasons, mainly for the large sums of money involved. Sri Lanka too faces its own problems pertaining to smuggling rackets operating locally and internationally. People smuggling was an issue that was of great concern to Sri Lanka recently. However, stringent measures taken by local authorities and policy changes on the part of the respective countries had reduced the number of ‘boat people’ drastically. However, since of late, several persons had been arrested for smuggling walla patta, a tree with the scientific name Gyrinops walla. Although the arrests have been frequent since of late, the importance and the reason for its surge in commercial value is still unknown to many people. Says an article by Dr. Upul Subasinghe, Senior Lecturer, Department of Forestry and Environmental Science, University of Sri Jayewardenepura, Nugegoda, published in the website of the Department of Wildlife Conservation (DWC). Accordingly, the fibrous nature of the bark enabled villagers to use it as a binding material in the past. However, environmentalists pointed out that the walla patta was not considered to be of commercial importance earlier. In fact, they pointed out that villagers stopped growing them in their home gardens as there was no commercial value involved. Environmental Lawyer Jagath Gunawardena speaking to The Nation said the wood was used for carvings and several other purposes that had very little commercial value. However, he said the commercial value of the tree suddenly increased when it was found out that the resin, found in the tree could be used to produce non-alcoholic perfumes. “The exact commercial value cannot be determined. But, it is worth hundreds and thousands of rupees,” Gunawardena said. Director, Environment Conservation Trust (ECT) Sajeewa Chamikara stated that walla patta, if cultivated properly could bring in revenue to the country and also would provide job opportunities to many people. He pointed out that the specie was not difficult to cultivate, and would also provide forest cover. 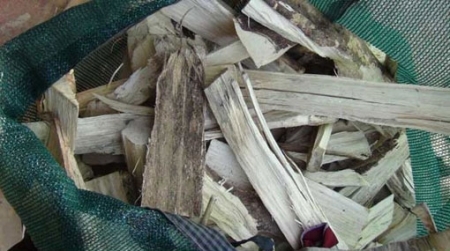 Commenting on the recent increase in walla patta smuggling, Chamikara said that those who smuggled did not have the knowledge as to how the resin, which is used to produce perfumes, is formed. “The resin is formed when certain parts of the tree are damaged. The resin forms in the damaged parts due to fungus,” he said. “What happens is that trees that are not damaged are cut down. There is no value in such trees,” he added. Speaking to The Nation, Minister of Agriculture Mahinda Yapa Abeywardena said that a proposal had been handed over to the Cabinet for approval to make walla patta for commercial activities. “Walla patta comes under protected species. That is why it is illegal to use them for commercial activities. However, we have handed over a proposal for walla patta to be used commercially. If that comes through, we can work out a way as to how we can grow more trees and use them for this purpose,” he said. According to the DWC, there are eight species of Gyrinops that could be found worldwide. Two of the species Gyrinops ledermanii and G. versteegii are used for agarwood production. The commercial value of walla patta was known only as recent as 2012. What is found in Sri Lanka is Gyrinops walla. The DMC stated that researches carried out by a team headed by Dr. Subasinghe himself had revealed that the quality of agarwood produced by walla patta was similar to that are available in the market produced by Aquilaria species. Aquilaria is a type of species that had been used to produce expensive fragrance and has been in demand due to the quality of the products. However, the focus has now shifted to walla patta due to the difficulty in finding wild grown Aquilaria. Since of late, Aquilaria has been subject to illegal harvesting. The increasing demand for agarwood has also resulted in tree mortality. Dr. Subasinghe has stated that walla patta would also face the same fate as Aquilaria, if the authorities do not act on the issue immediately. “Loss of lowland forest habitats also threatens populations of these species. Agarwood producing species are becoming more difficult to find, as reported by collectors, non-infected trees are increasingly being felled and collection is taking place within protected areas,” DWC report added. Environmentalists have now expressed serious concerns over threats of such species facing extinction due to rapidly increasing demands. Dr. Subasinghe has also pointed out that the over-use of agarwood producing species had seriously affected the natural resources of all species capable of producing agarwood. They have therefore been listed as endangered species in Appendix II of the Convention on Internal Trade in Endangered Species of Wild Fauna and Flora (CITES). Chamikara also stated that the lack of knowledge on the subject had resulted in walla patta enlisted as an endangered species. Meanwhile, the Police too have initiated stringent measures to curb walla patta smuggling. Police Spokesperson SSP Ajith Rohana said the sudden increase of smuggling of walla patta to the fact that the species found in Sri Lanka is of good quality. “It is a lucrative business, as the particular species found in Sri Lanka is one of the best varieties while it is rare in other regions,” he said speaking to The Nation. According to him the Police Environment Unit is constantly alert regarding felling of trees and their transportation. The walla patta is found in forest areas belonging to the lower wet zone of the country. Accordingly, it is predominantly found in areas such as Colombo, Kalutara, Kegalle, and Ratnapura.